Spring is finally starting around here. 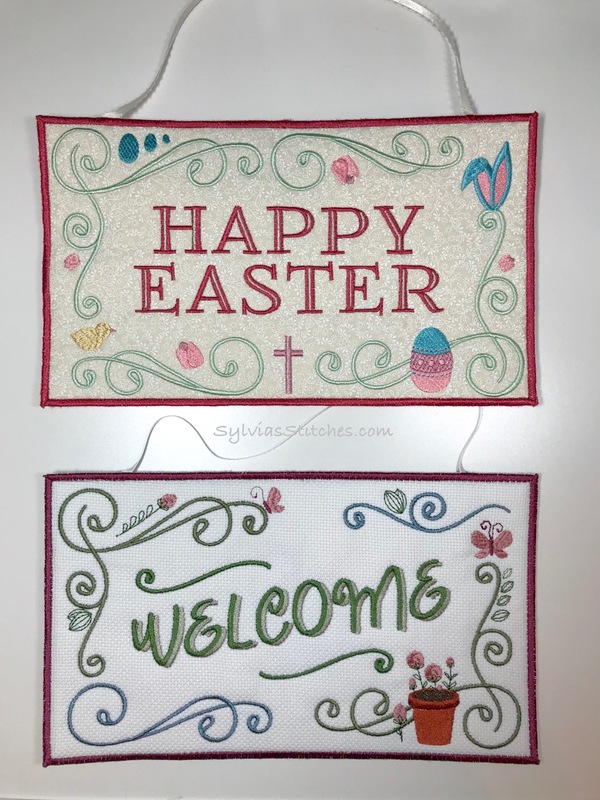 I stitched up a couple of seasonal Welcome signs that came in my March 2018 All Access issue from Anita Goodesign. There are ten different designs in this set. 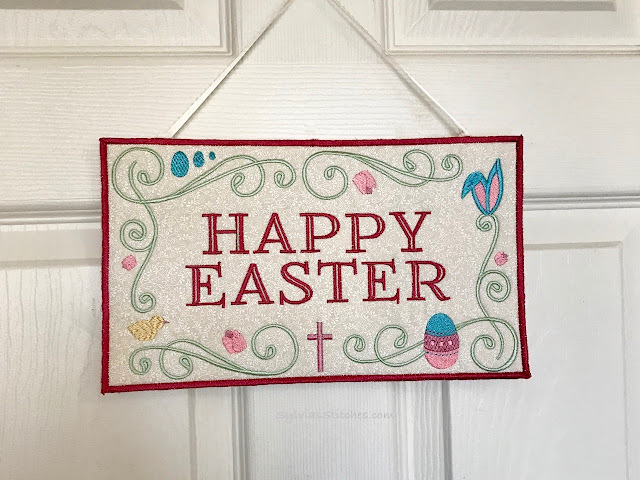 I made the Easter sign a few weeks ago. 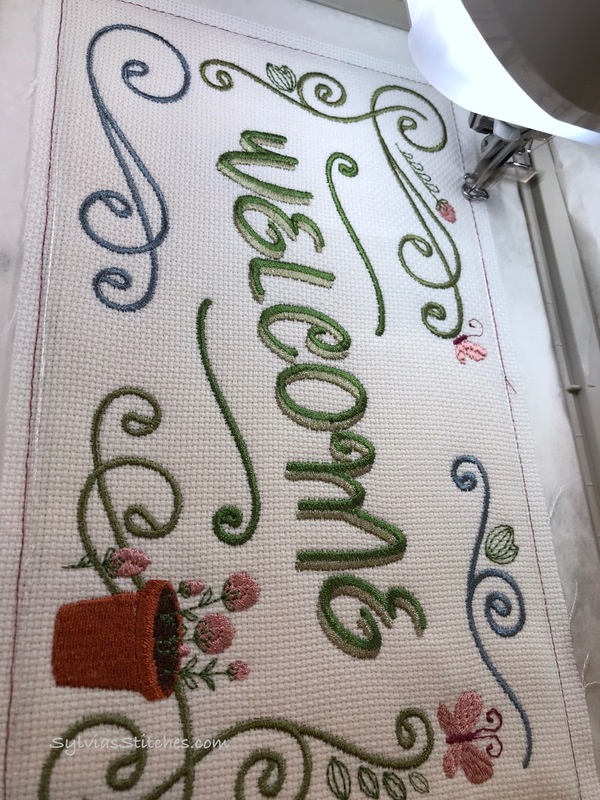 Today, I made the Welcome one for spring. 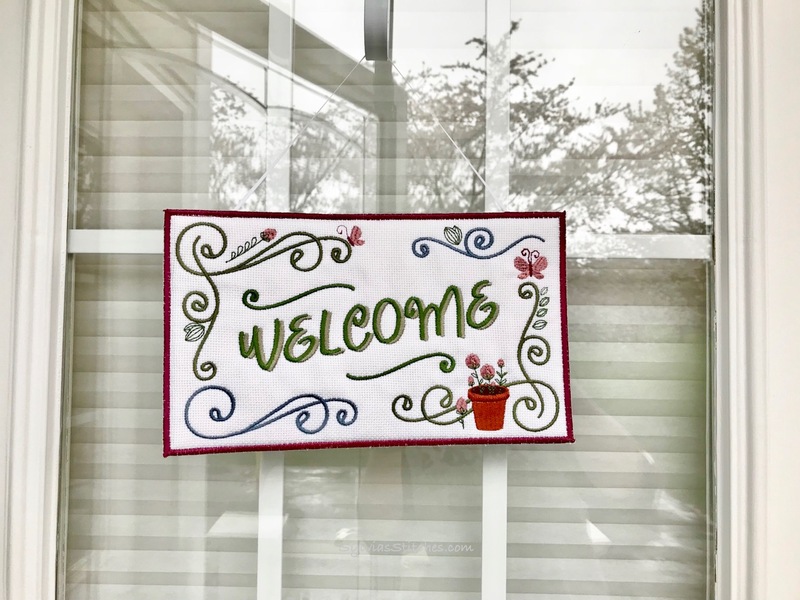 Finished sign hanging outside our door, but behind a storm door for protection from the elements. First seasonal sign I did from this set. First hoop the tear-away stabilizer. Run the stitches to mark the batting placement, the batting tack-down, and the front fabric tack-down. Embroidery with just the tearaway stabilizer in the hoop. 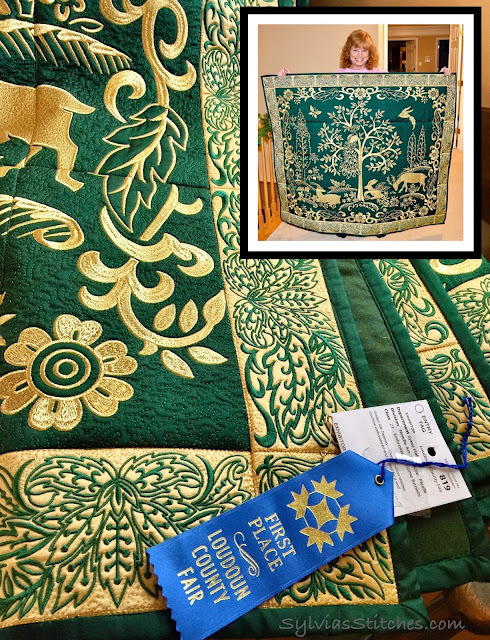 Once the front fabric is tacked down, stitch out the design as normal. 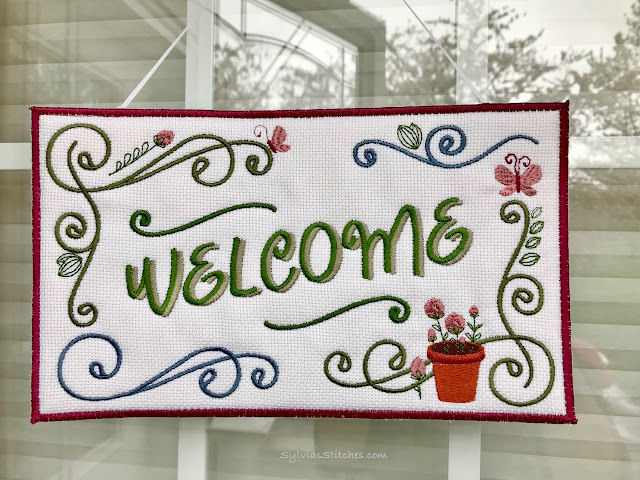 I used aida cloth on this Welcome sign for more of a hand-stitch look. When the design is finished, remove the hoop from the machine, and on the back, add the ribbon, stiffener and back fabric. 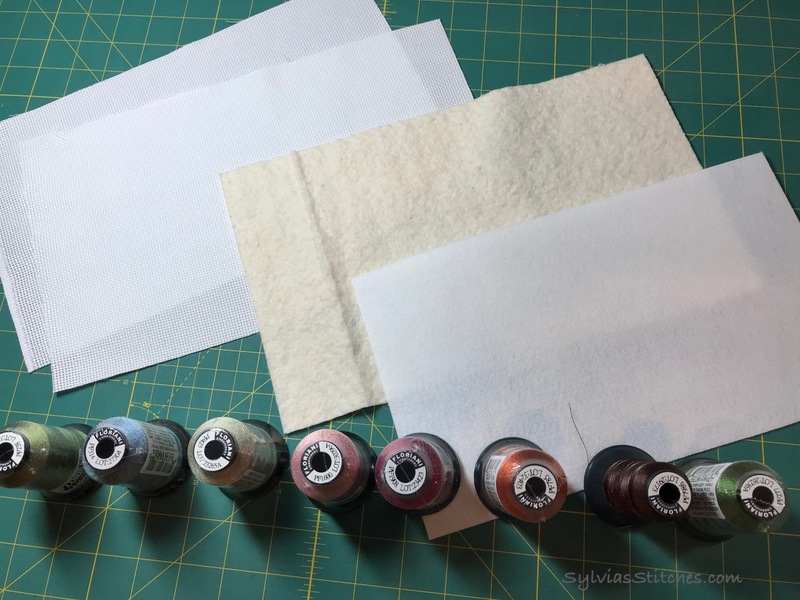 Use tape and fabric spray to hold in place. 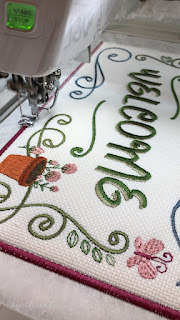 Return hoop to machine and stitch the step to attach all the fabrics together. The stitching in red thread ties all the fabrics together. 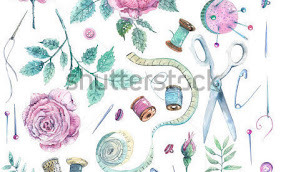 Remove the hoop from the machine again and trim the fabrics as close to the stitching as possible. Tape the ribbon to stay out of the way for the final step. 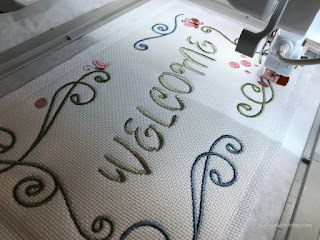 Run the final step to stitch the statin border. 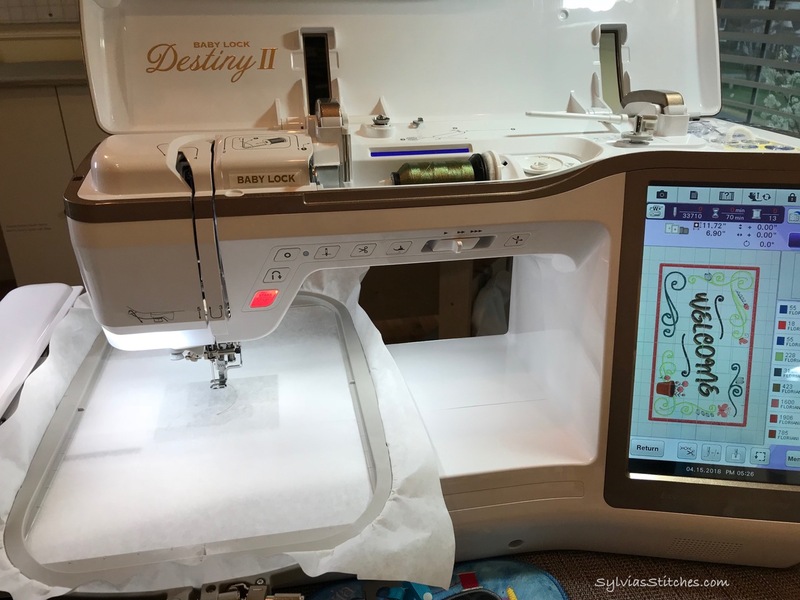 Be sure to use a bobbin thread that matches the top for this step. The final statin border stitching may start to preforate the stabilizer. When finished, just tear the sign away from the stabilizer. 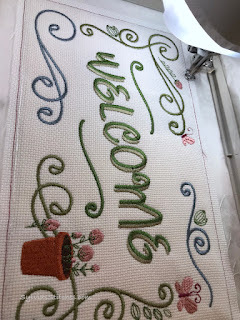 If there are any stray threads, or stabilizer showing, carefully trim from border edge. I used a red sharpie on the Easter sign to touch up the edges to match the satin border. I did not do any touch up on the spring Welcome sign. A couple of signs for the season. I really like these signs. They are a good size, and stitch up easily. I may do more of these as the seasons change. 😃 I'm sharing this on Craftastic Monday.